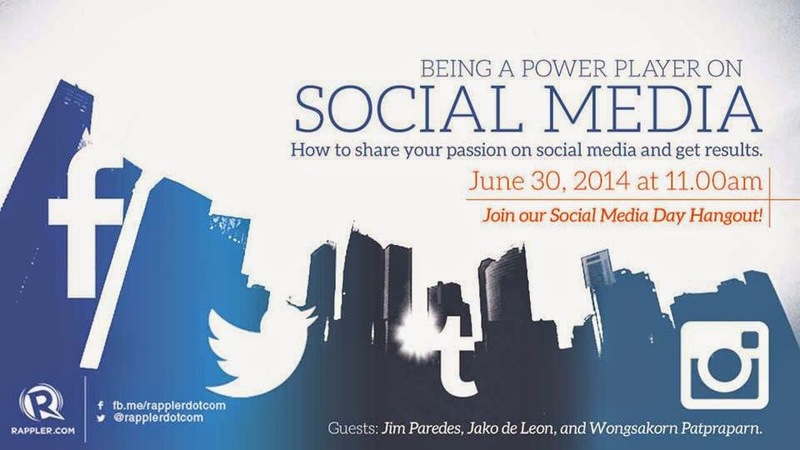 #SocialMediaDay Hangouts by Rappler entitled "Being a Power Player in Social Media" is now LIVE on http://rappler.com today, June 30, 2014! Have you ever wondered how Social Media celebrities rose to internet fame? Send your questions for Jim Paredes (Singer/Composer), Jako de Leon (Creator/Executive Producer, Bogart the Explorer), and Chan Patpraparn (Lowcostcosplay) using #SocialMediaDay. This is hosted by Michael Josh Villanueva. Join the Social Media Day Hangouts at 11AM today!